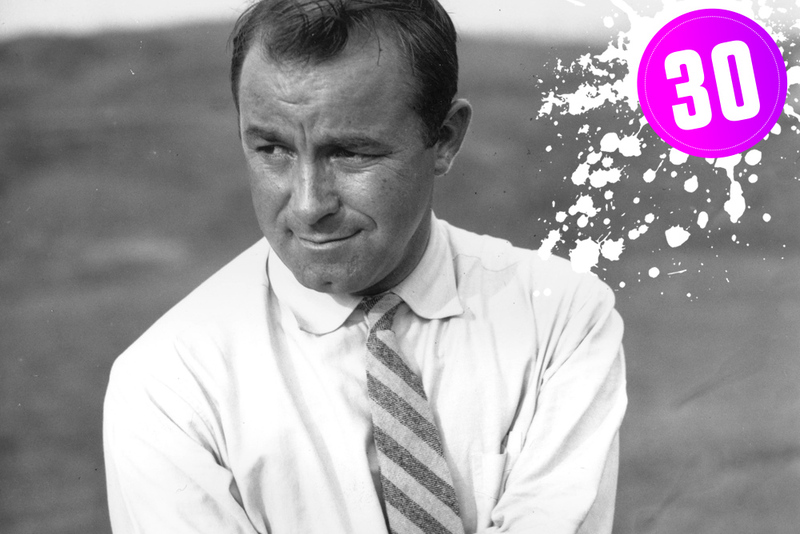 Gene Sarazen invented the sand wedge. Get that through your head for a moment. If it wasn’t for him, escaping the bunker would be 10 times harder than it already is. The Sicilian immigrant was born Eugenio Saraceni was most famous for 'The Shot Heard Around The World', his double eagle in the 1945 Masters, when he slammed in a four wood from 234 yards. This shot put him back in contention and he eventually beat Craig Wood in the playoff. He hit the second 'Shot Heard Around The World' when, at the age of 71, he made a hole in one in the 1973 Open, acing the Postage Stamp at Royal Troon. His battles with Bobby Jones and Walter Hagen are the stuff of golfing legend and he bagged seven majors AND a Grand Slam in his time. But it's Sarazen's ingenious invention of a golf club that cements his place in the top 50 GolfPunks Of All Time. Ian Botham: “Brian was a real crowd pleaser and one of the most underrated British golfers in my opinion. His contribution to the game was huge. He played in six Ryder Cup teams and beat Jack Nicklaus twice in a day at Laurel Canyon in the well beaten side of 1975." As Barnesy himself recalls: "Arnold (Palmer) had gone to Bernard Hunt the night before and said, “who have you got in your side who might give Jack a game?” Bernard replied, “I know Jack and Barnesy have fished together and played a few tournaments together so maybe he is not so much in awe as the other guys would be.” I agreed; I thought that because I had known Jack for so many years, I wouldn’t have been affected by him standing on the 1st tee. Of course, I was s******g myself when the time came round, but not as badly as some of the other guys would have been. So we played together and I won 4&2. Very nice indeed." Barnes certainly didn't take himself too seriously. 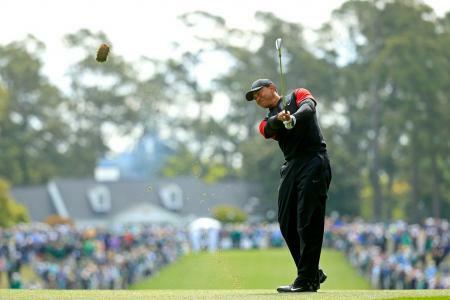 He used to start preparing for the day at six am, with six or eight large brandy and coffees before the first tee. “I couldn’t play without it, I thought”, he said. He once marked his ball with a half full beer can in a tour event. 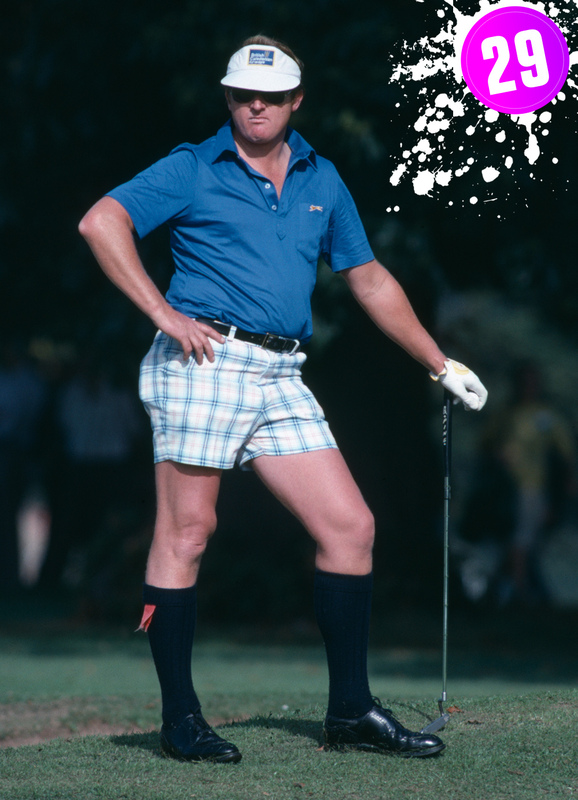 Built like the proverbial brick out house, Barnes cut quite a dash on tour, often wearing high cut shorts, pipe hanging out of mouth and beer in hand, he was a genuine stand out character in an era of many. However, as arch-competitor Ray Floyd recalls playing against him in the World Match Play: “Brian was very competitive, but in 36 holes he drank beer all around the golf course. He won that match." After putting his drink demons to bed Barnes went on to have a great career on the Seniors Tour winning, and then retaining the Senior Open in 1995 and 1996. Staunch Central. Born to a poor family in Puerto Rico, Chi Chi Rodríguez, like many from a similar background, started out as a caddie at his local course. He soon became enamoured with the game and, realising he couldn't afford actual clubs, he made his own by taking a branch from a guava tree and fashioning it into a golf club. His golf balls were metal cans and he taught himself how to "play like the golfers he caddied for". By the time he was nine years old, he was proficient at golf and in 1947 at the age of 12, he scored a 67. When he joined the PGA Tour in 1960 he soon made a name for himself as a genuine showman, covering the hole with his hat whenever he made birdie or eagle, until he heard that other golfers were complaining about it (muppets!). 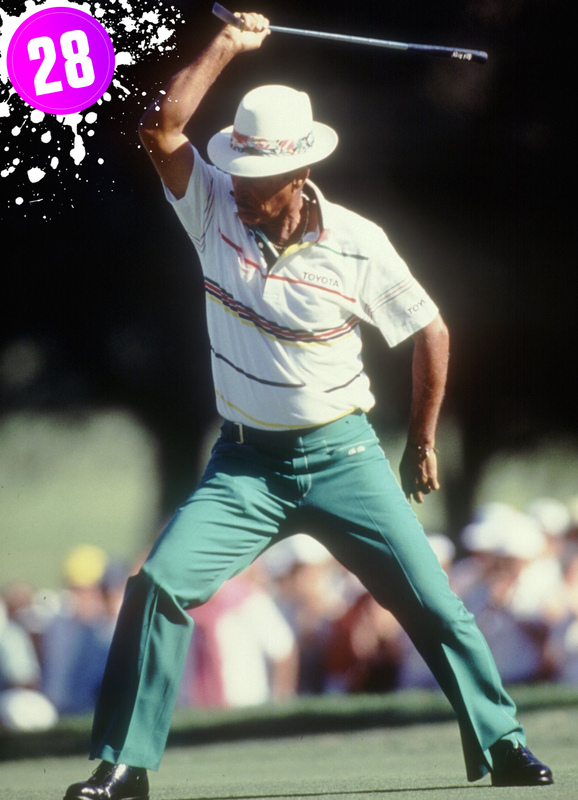 Instead, he developed his signature 'toreador dance' where the ball was a 'bull' and his putter was a 'sword'. Picture above shows Chi Chi 'terminating' the bull. Rodríguez would often make jokes about his past hardships on the golf course, such as, "How long does John Daly drive a golf ball? When I was a kid, I didn't go that far on vacation." And, "Playing golf is not hot work. Cutting sugar cane for a dollar a day — that's hot work. Hotter than my first wrist watch." He looked like a film star on the golf star. Cool as you can get, Chi Chi could play too, winning eight times on the PGA Tour and 22 times on the Senior Tour. He was also the first Puerto Rican inducted into Golf's Hall Of Fame. As one half of the world’s greatest ever comedy duo, Oliver Hardy was afforded the luxury of a hobby that few of his peers growing up in Harlem, Georgia in hard times could have dreamed of. 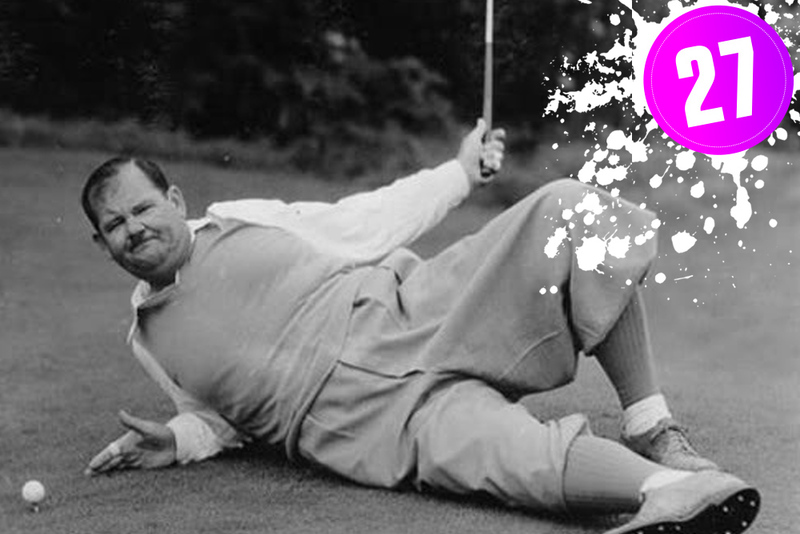 Babe, as he was nicknamed, took to golf like a duck to water. It would be fair to say he was obsessed with the great sport. So much so that his partner Stan Laurel would use it to his advantage on set: In order to get that ‘completely, at his wit’s end, exasperated’ look that Ollie was famed for whenever Stan had exhausted his patience, Stan would deliberately demand new takes on certain scenes so that Ollie would run late and be in danger of missing his tee time. Result? That look. Genius. Karsten Solheim didn't even take up golf until he was 42, but boy did he make up for lost time. He quickly fell for the game and finding that his main problem was putting, he designed himself a revolutionary putter. Instead of attaching the shaft at the heel of the blade, he attached it in the center, applying scientific principles to golf club design, which had previously been based largely on trial and error, transferring much of the weight of the club head to the perimeter. Solheim started manufacturing golf clubs in his garage and introducing them to tour pros after he moved to Phoenix. 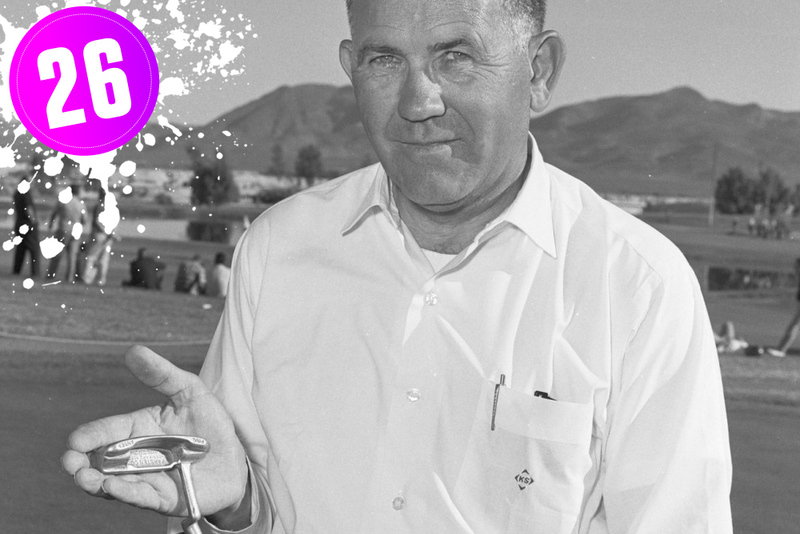 His break came in February 1967 when Julius Borros won The Phoenix Open using one of Solheim's Anser putters. 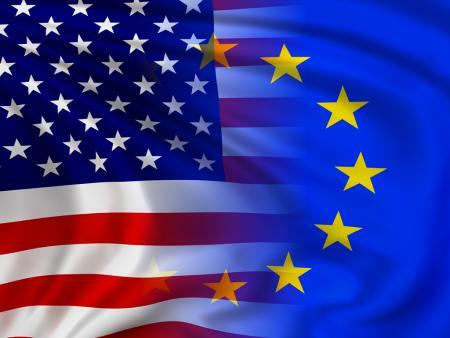 This prompted Solheim to set up Karsten Manufacturing, makers of PING. In 1969, he introduced irons based on the same principle of perimeter weighting, and these were quickly successful. The other golf equipment manufacturers soon followed his innovations, which became industry standards. Solheim's contribution of perimeter weighting and usage of investment casting are recognized as two of the key innovations in the history of golf. So next time you hole a putt or flush an eight iron, give a little doff of your cap to Mr Karsten Solheim.